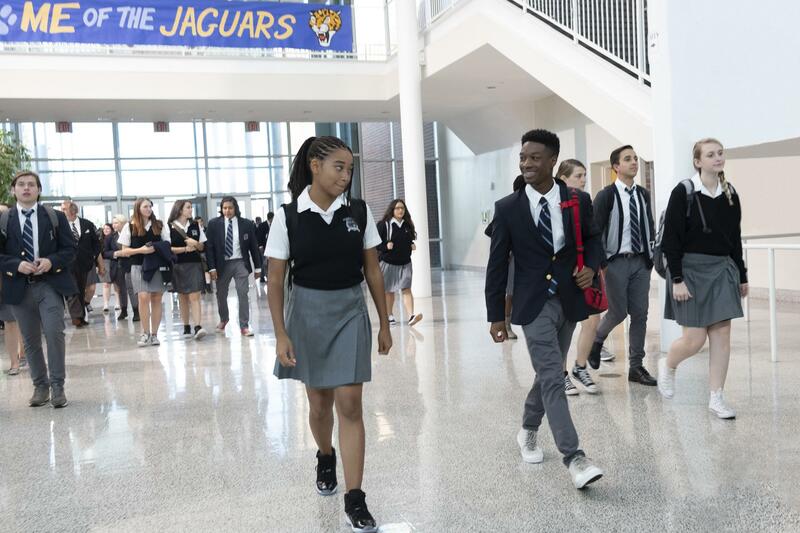 Starr Carter (played by Amandla Stenberg, left) is a black student in a primarily white prep school in The Hate U Give. 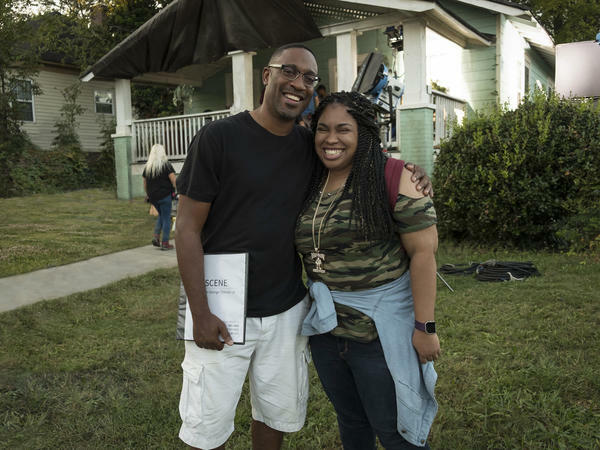 Director George Tillman, Jr. and author Angie Thomas pose on the set of The Hate U Give. The Hate U Give tells the story of a 16-year-old girl named Starr Carter. She lives in a mostly black, lower-income neighborhood called Garden Heights. Williamson Prep, her high school, is in a mostly white, affluent part of town. But Starr can't keep her two worlds separate after she witnesses a white police officer shoot and kill her childhood friend, Khalil. The Hate U Give was first a young adult novel by Angie Thomas. Now it's also a movie directed by George Tillman Jr. We talked with Thomas and Tillman about how their works reflect some of their own experiences. Tillman: You know, it was a very emotional scene. I remember Russell Hornsby, who plays Mav Carter, would choke up because he has kids himself. I have a 15-year-old son. So it was a very emotional time because in the African-American community, that is something that every kid have been through one way or another. For me, it was with my uncles and my dad. You know, they came out of the MLK riots, you know, in '68 with family members in Detroit and Milwaukee, Wis. So all those things were planted inside me. So in the movie, you know, it's two young kids who actually hearing the scene for the first time. It was just emotional. This deals with history. This deal with survival and how we can continue to stay on this earth without police brutality or being shot or being killed. You know, this is part of the fear of the African-American community. Thomas: It was a struggle. I did — I lived in a mostly black, poor neighborhood in Jackson, Miss. And I went to a mostly white, upper-class, private school just 10 minutes away from my home. But in 10 minutes, it was like going into an entirely different world. So I overcompensated by doing what's called code switching. One time, one of my professors had a party at his house for Christmas, and he had a huge Christmas tree with a big pile of gifts underneath. And we could all pick a gift. And it was like gag gifts, like whoopee cushions and all of this other stuff he was just trying to get rid of. And when it was my turn, I picked a gift. And there was a prescription drug book inside and a toy water gun. And one of my classmates goes, "Oh my God, the black girl from the ghetto got the drug book and the gun, how funny." And because some of my classmates were laughing — and I just made myself laugh because I thought I had to. And that was one of those moments where I was so angry at myself for not speaking up. And honestly, that was a defining moment for me because I had to realize that I was worth speaking up for if nothing else, and that they needed to know that even a joke like that is not OK. So for me, that was the moment I said, "You know what? I am not going to be silent again." Tillman: That scene was a very important moment in the book. And I really wanted to show all the sides, you know? ... The idea of how the system, you know, for police officers — and how that goes all the way back to the idea of the slave patrols with free slaves. And that's a system that is taught. And sometime that system can be taught with African-Americans as well. So you have that version. And then also, you have another layer on top of that — is that sometimes as African-Americans, we have racism and bias inside ourselves and how we see other African-Americans as well. Thomas: I'm a huge young adult fiction fan anyway, and I always knew I wanted to write young adult fiction. But it was definitely a decision early on to write this from the perspective of a 16-year-old girl for several reasons. The first reason for me was because so often, victims in these cases are teenagers. They're young people. Trayvon Martin was 17. Tamir Rice was 12. And I think about those kids who look at them and see themselves, and I wanted to talk to them first and foremost. But I also knew that when adults pick this book up, they would be more likely to empathize with a 16-year-old girl than a 30-year-old woman. For some audiences, there is something about getting it from the perspective of someone who has so much innocence, who has so little experience. You literally witness this girl become a woman. You see her forced into adulthood because of her trauma. And I think there's something about that. At least for adults, there's something about seeing a child go through this. And my hope was that people will look at real-life 16-year-olds in these cases and actually see them as children and not as adults. Mallory Yu and Emily Kopp produced and edited this story for broadcast. Patrick Jarenwattananon adapted it for the Web. "The Hate U Give" tells the story of a 16-year-old girl named Starr Carter. She lives in a mostly black, lower-income neighborhood called Garden Heights. Williamson Prep, her high school, is in a mostly white, affluent part of town. AMANDLA STENBERG: (As Starr Carter) Garden Heights is one world. Williamson is another. And I got to keep it separate. So when I'm here, I'm Starr version two. CHANG: But Starr can't keep her two worlds separate after she witnesses a white police officers shoot and kill her childhood friend, Khalil. "The Hate U Give" was first a YA novel by Angie Thomas. Now it's also a movie directed by George Tillman Jr. The three of us began our conversation with the scene that opens the film. Starr's father, Mav Carter, is giving his young children the talk. RUSSELL HORNSBY: (As Mav Carter) Now, one day, y'all going to be with me, and you best bet we going to get pulled over. Now, that don't mean I did something wrong. Maybe I made a mistake driving, or maybe I ain't do nothing at all. You going to see me with my hands like this on the dashboard. Now, you keep your hands posted 'cause moving makes the police get all nervous. It can get real dangerous, so don't argue with them. But keep your hands where they can see them. This is how you going to act. We straight? STENBERG: (As Starr Carter) I was 9 years old when I first got the talk. CHANG: George, I know you based this scene on talks you yourself got growing up. What is it like to film a scene that's fictional but that represents something completely real to most of the black community? GEORGE TILLMAN JR: You know, it was a very emotional scene. I remember Russell Hornsby, who plays Mav Carter, would choke up because he has kids himself. I have a 15-year-old son. So it was a very emotional time because in the African-American community, that is something that every kid have been through one way or another. For me, it was with my uncles and my dad. You know, they came out of the MLK riots, you know, in '68 with family members in Detroit and Milwaukee, Wis. So all those things were planted inside me. CHANG: One of the most fascinating storylines for me is how Starr feels like she has to be two different people all the time. And she thinks part of that means literally subduing her blackness while she's walking around her mostly white high school, Williamson Prep. STENBERG: (As Starr Carter) Slang makes them cool. Slang makes me hood. UNIDENTIFIED ACTOR: (As character) Yo, those kicks are lit. STENBERG: (As Starr Carter) Thanks - Space Jams. (As Starr Carter) Basically Williamson Starr doesn't give anyone a reason to call her ghetto. And I hate myself for doing it. CHANG: Angie, I read that part of the inspiration for Starr's double life came from your own life because you also lived in a mostly black neighborhood while attending a mostly white, private, Christian college in Mississippi. What was that like feeling like you had to be two different people all the time? ANGIE THOMAS: It was a struggle. I did - I lived in a mostly black, poor neighborhood in Jackson, Miss. And I went to a mostly white, upper-class, private school just 10 minutes away from my home. But in 10 minutes, it was like going into an entirely different world. So I overcompensated by doing what's called code switching. THOMAS: I would make myself more presentable I thought. I was careful of how I spoke. I was careful of how much emotion I showed. And it was a struggle because so often I was silent on things that mattered to me. And I would experience microaggressions from my classmates, and I was silent about them. I never called out the racism. THOMAS: Well, one time, one of my professors had a party at his house for Christmas, and he had a huge Christmas tree with a big pile of gifts underneath. And we could all pick a gift. And it was like gag gifts like whoopee cushions and all of this other stuff he was just trying to get rid of. And when it was my turn, I picked a gift. And there was a prescription drug book inside and a toy water gun. And one of my classmates goes, oh, my God, the black girl from the ghetto got the drug book and the gun - how funny. THOMAS: And because some of my classmates were laughing - and I just made myself laugh because I thought I had to. And that was one of those moments where I was so angry at myself for not speaking up. And honestly, that was a defining moment for me because I had to realize that I was worth speaking up for if nothing else and that they needed to know that even a joke like that is not OK. So for me, that was the moment I said, you know what? I am not going to be silent again. CHANG: Yeah. One thing that was so fascinating was this movie doesn't only look at the disconnect between black and white. It also touches upon where the black community can disagree, like when Starr's Uncle Carlos, who's a cop, straight up tells Starr how he would react to a black suspect. COMMON: (As Carlos) A lot goes through a cop's mind when they pull someone over. Are they hiding something? Is the car stolen? STENBERG: (As Starr Carter) But you still don't know if they did anything wrong. COMMON: (As Carlos) That's why we search them. But if they open the door or reach through an open window, they're probably going for a weapon. So if I think I see a gun, I don't hesitate. I shoot. CHANG: It was so interesting to hear a black man own that in this movie because it shows that, you know, this isn't just white-against-black racism. It's much more complicated, right? You're saying, George, that it's not just white people that are to blame for the racial bias we see in policing. TILLMAN JR: Yes, definitely. It's - that scene was a very important moment in the book. And I really wanted to show all the sides, you know? Two is this - the idea of how the system, you know, for police officers - and how that goes all the way back to the idea of the slave patrols with free slaves. And that's a system that is taught. And sometime that system can be taught with African-Americans as well. So you have that version. And then also you have another layer on top of that - is that sometimes as African-Americans, we have racism and biism (ph) inside ourselves and how we see other African-Americans as well. CHANG: Angie, you told this story through the eyes of a 16-year-old. Do you think audiences are more capable of empathy when they're watching a kid rather than an adult grapple with this kind of trauma, receiving this kind of trauma? THOMAS: Yeah. When I first decided to write it - I'm a huge young adult fiction fan anyway, and I always knew I wanted to write young adult fiction. But it was definitely a decision early on to write this from the perspective of a 16-year-old girl for several reasons. The first reason for me was because so often, victims in these cases are teenagers. They're young people. Trayvon Martin was 17. Tamir Rice was 12. And I think about those kids who look at them and see themselves, and I wanted to talk to them first and foremost. CHANG: Writer Angie Thomas and director George Tillman Jr. - their new movie is called "The Hate U Give." Thank you both very much. It was a real pleasure to talk to both of you guys. TILLMAN JR: Thank you for having us. TILLMAN JR: Thank you. Transcript provided by NPR, Copyright NPR.